SP501/SP502-Solenoid Poppet Valve | Tucson Hydrocontrols Pvt. Ltd.
A cartridge valve designed with positive shut off to be used in load holding applications. Typical usage includes the control of actuators in a hydraulic system, decompression of hydraulic fluid in heavy cylinders etc. Normally Closed (N.C.) When de-energized, the Poppet Valve acts as a check valve, allowing flow from 1 to2 , while blocking flow from 2 to 1. When energized, the poppet lifts to open the  to  flow path. Normally Open (N.O.) When de-energized, the DSV2-100-2NOP poppet is open to allow flow from 2 to 1. 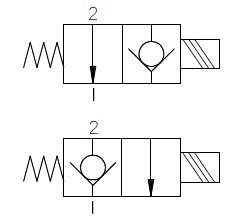 When energized, the poppet closes to block flow from 2 to 1. In this condition, the cartridge allows reverse flow from 1 to 2 after overcoming the solenoid force - 50 PSI (3 Bar). Operation of Manual Override Option: To override, push button in, twist counterclockwise and release. In this position, valve will remain open in a detented condition. To return to normal operation, push button in, twist clockwise and release. Override will be detented in this position.